The single, bivy-style pole configuration creates an ample interior space, with a spacious foot box to keep condensation off of toes, and the innovative, T-zip mesh design allows entry on either side which creates a cozy portable camping hammock when rolled down. A 100%-waterproof, UV-resistant rainfly clips directly to the corners, and its distinct lateral wing cut keeps gear and ground dry below. 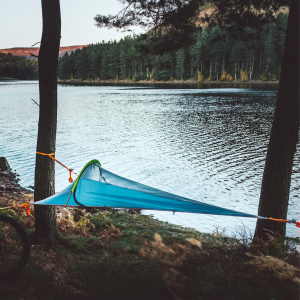 The Tentsile UNA is a 1-person suspended Tree Tent that lets you venture deep into the wild. A comfortable all-weather shelter, our portable treehouse style tent helps you set up futuristic campsites over hard, wet, rocky and uneven terrain all year round! Perfectly-sized for adults 6’ tall and under, our 6.2-lbs. Tree Tent offers 24 sq. feet of sheltered space with a 330-lbs. weight capacity that combines the comfort of a conventional tent with the slumber-inducing coziness of a relaxing hammock. 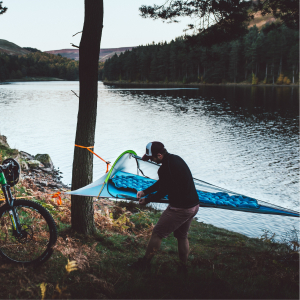 UNA uses 1 powerful ratchet and 3 dependable straps to anchor to 3 strong trees, where it’s safely secured by heavy-duty industrial webbing—making it an innovative must-have camping tool that means you never have to sleep on the cold hard ground again! Featuring a front entryway, see-through mesh netting and a removable water- and UV-resistant rainfly enclosure that protects against the elements, UNA’s insulation can be increased with our cushiony SkyPad Mattress to help combat cold weather conditions. 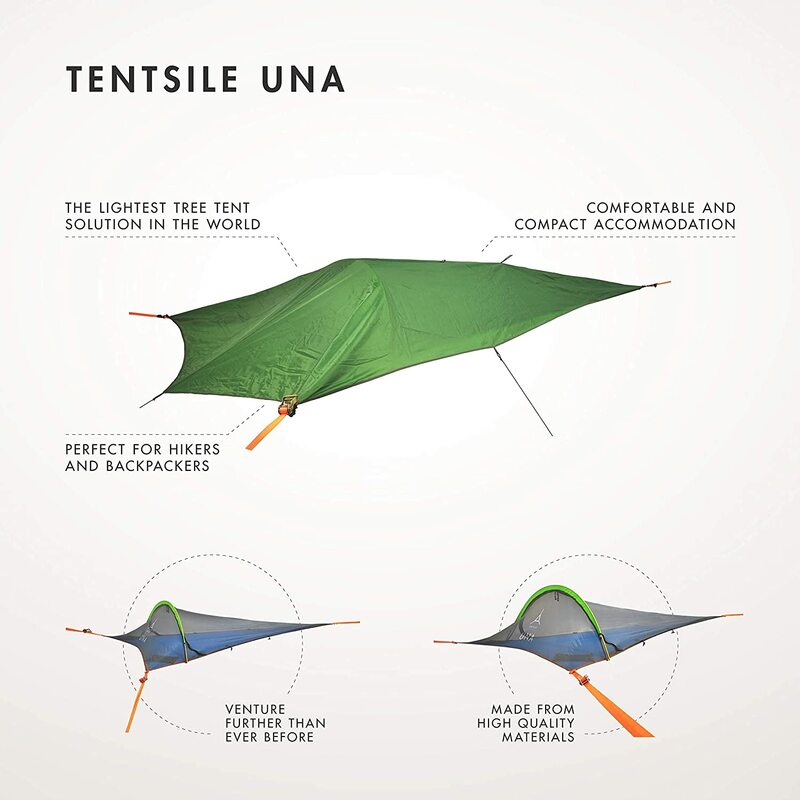 UNA’s dynamic rainfly also creates a shaded porch/two-story campsite to keep gear dry, and a windbreaking thermal buffer for when the weather turns… Tentsile even saves forests by planting 18 trees for all tents and hammocks our nature-loving clients buy! No Hard lumping ground to lay on! Made from high quality materials and tested to rigorous standards. This is the premier Tree Tent to compliment our range. As our tents are designed to be suspended in tension, the tents are unaffected by topography or water, and they also provide increased separation from bugs, snakes and other, larger predators. The unique design provides comfortable and spacious accommodation in any environment. The UNA comes with a fully enclosed insect mesh roof (with opening doors) and removable rainfly sheet so you can enjoy the stars on a clear night!